Fancy Paua Shell set Sterling Silver earring studs, 4mm size. Rope edge design Paua shell Abalone set pair of 925 earring studs. Pink shell set 4mm Rope edge design Sterling 925 Silver earring studs, in pairs. Fancy design Silver Pink clam shell set earring studs. Mother of Pearl stone set 4mm Rope edged effect Sterling Silver ear Studs per pair. Natural Mother of Pearl shell fancy Silver 925 ear studs. Square shape Abalone shell Paua set Sterling Silver ear studs, sold in pairs. Abalone shell Sterling 925 Silver round shape ear studs in pairs. Paua shell set in round Silver earring studs, 4mm size stud. Large 6mm Clam Pink Shell set Sterling Silver earring studs. Pair of Pink real Shell set round design 925 ear studs. Clear large CZ stones set Pendant and Earring Studs in Gold on solid Sterling Silver. 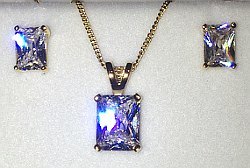 CZ set Pendant with 18inch Gold on 925 Silver Chain plus pair of CZ Ear Studs matching set. 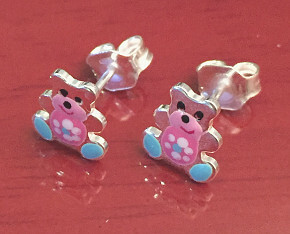 Enamel coloured Sterling Silver Teddy Bear Earring Studs (pair). 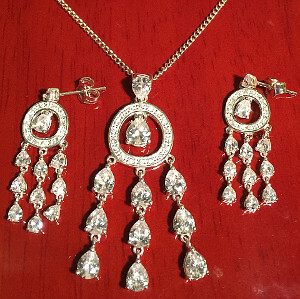 Sterling Silver CZ set Chandelier design Earrings and Pendant set.